We started this remodel. Yeah, Wow that is kinda scary to say out loud. It's amazing how much still needs to be done after all that time too. How is that possible? Most days I try not to focus on that. Truthfully so much has been done in three years. In a visual sense we're sitting on the top of the mountain peak looking down at the decent. You're tired and you know it's a long way to go, but the relaxing at the end is always worth the decent. The past few weeks really have been pretty mixed with productivity and setbacks. 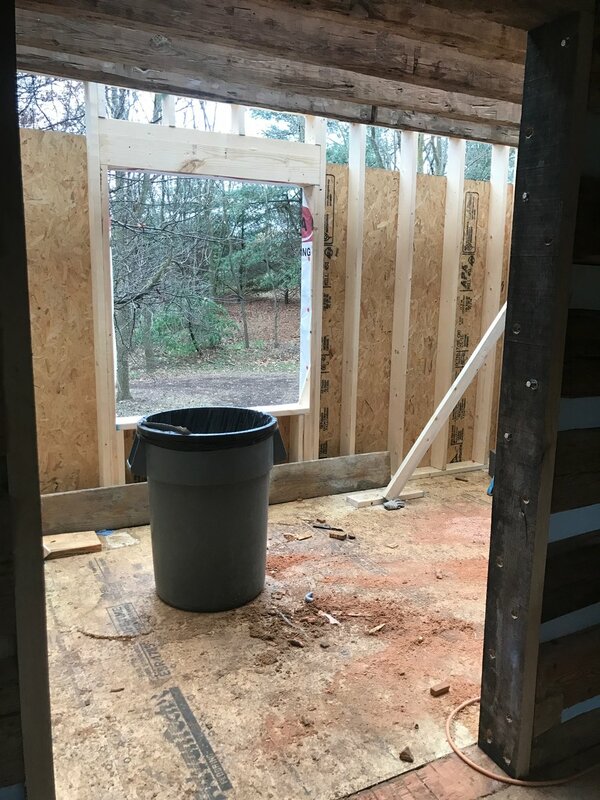 We have been working to get the addition part of the house closed in, which included building the floors, walls, adding the rafters, plywood and paper on the roof. Then framing in that gable, blocking the rafters, putting plywood on the gable end and house wrap. I learned how roofs are put together, and I also learned I no longer have a fear of heights. It was replaced with a fear of watching my father, chases father and chase be up high on tiny slats. I couldn't decide if I wanted to be up high with them ready to do a cartoon dangle off the side of the roof with their arm or pacing the ground prepared to be a human buffer. Obviously neither were realistic so I alternated between both. I was able to practice perfecting my hammering skills, and even busted my finger open good, so I'm like an official carpenter now. Right of passage ya know. The day we put the last piece on it was sprinkling and it was slippery, when the last roof tab went in I felt like I had just finished a marathon. Along with the roof we've been working on a few slaps of soapstone for countertops in the kitchen. Don't worry, we've read all the reviews, the good and the bad, but we're giving them a shot anyways. The patina/wore look will just blend in with the logs in a few years. They can be worked with regular wood working tools with diamond blades and carbide bits. We are still fabricating them, and only have put one piece down permanently. That one was the largest piece, and we all were on pins and needles moving it in. Let me be clear, it weighs a lot, and has white veins which are known to crack. I love the veins and really have been looking forward to them visually, but the prepping and moving of them also gives me anxiety. It's a give and take too. As we finish the other pieces and seam them together with which ever epoxy we finally choose (another back and forth, forum after forum search), we will them wax them and install the faucet and backsplash. Isn't it lovely how quickly that is said, now lets see how fast I can make it done. I have had my mind made up about the backsplash for two years now, and have been patiently awaiting this time (some days not with much grace) so it doesn't seem real it's here. We will actually be able to use the kitchen if we want, and not as a work room. It will still be awhile before it's really used, but we can wash our hands and fill water bottles up from a sink instead of a outside hose and those are little victories in my book. I am still possibly going to change the green walls. Yes I know I have some fans of them out there, I once was too. And I may change my mind once the pieces come together, but day in day out it's just too much. To many colors going on in one space. We painted it long before the cherry tree turned into a bar top, before we used the hog barn shed wood as a wall cover. I'm ready to paint it like yesterday, but as chase says that's a rainy day, when we live here, project. It's amazing how small of a project it seems compared to the typical tasks here, I'm sure someday when remodel life wears off I may disagree with that statement, but currently it seems to easy not too. Paint is easy, it is removable, coverable, changeable. Hopefully I'll be reporting finished countertops or a roof ready for metal next. Not sure which will finish up first but either will be a win we need right now.